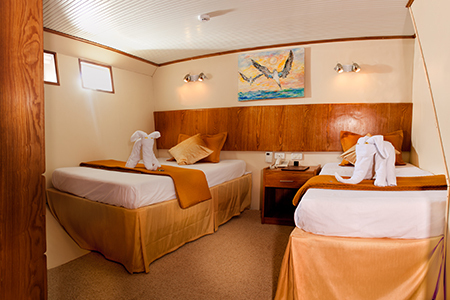 • All prices per person in US dollars. 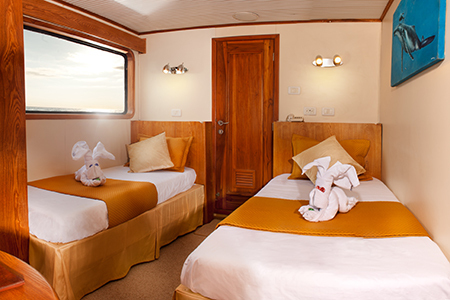 Lower Deck: 2 Double Cabins All cabins with private bathrooms, hot water and air-conditioning. 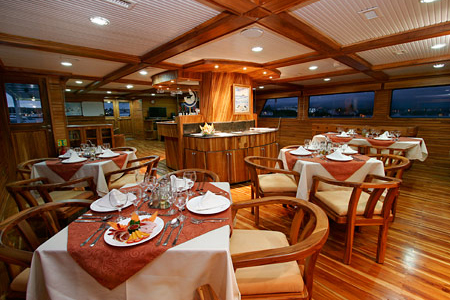 On Board: Dining room, bar and lounge, TV and DVD, library and sundeck. 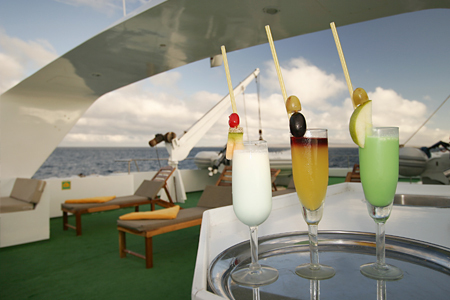 Please ask your Trip advisor for information on 10-Day, 11-Day, 15-Day Cruise itineraries for this boat. Back home and back to work!! We had a great trip and really enjoyed our time in Quito and the Galapagos Islands - did not want to go home. Thank you very much for the all the work and help you provided for our trip to your great county - it was really appreciated specially when we are on the other side of the world. We hope to get back you way and travel to the Amazon and explore more of Ecuador - will be contact for help again. My daughter Cassie is traveling through South America and next week s fly to the Galapagos Island, she wants to see last-minute promotions Are you Able to Provide any information for her? - I have copied so You have Cassie in her email. Any help would be grateful. Again many thanks for arranging our holiday, thanks. Our bag arrived successfully in Quito and also your representative did meet our plane that had been scheduled earlier than originally arranged. 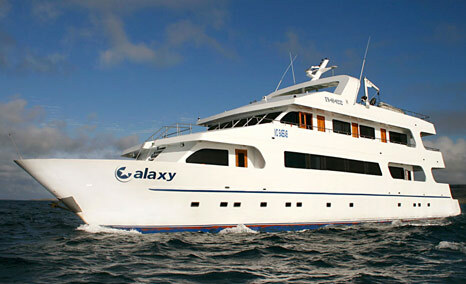 As a result our trip to the Galapagos was just wonderful with no hitches. Much of that success is the result of your efforts, often above and beyond the call of duty and we thank you. Our trip could not have been the success it was without your kind efforts on our behalf.